Did you know that the bible mentions the use of archery around 160 times? The bow and arrow was a common weapon during the time the Bible was written. Trinity Sportsman Ministries pulls from this huge resource to teach the students biblical truth while teaching them the sport of archery. Over the course of the last five years several organizations have joined us to make our archery programs the best possible. Organizations like Unity in the Community, Plant City YMCA, Central Florida Buckmasters chapter, East Hillsborough National Turkey Federation and Ducks Unlimited chapters. The clinics are typically a 3-4 week course that meets weekly for an hour of instruction. Student’s have a choice to participate in the basic or advanced classes. Each course will build the skills needed to become a better archer. This is done through skill drills and games while providing biblical truth to the students. Archery equipment is provided although each student can bring their own equipment once one of our staff inspects it and sees that the shooter has a basic operation of the bow. This is a 3 week course held several times a year. This course is an introduction course for archery. The class is for ages 6yrs to adults. We go through the parts of the bow and how to shoot the bow safely. The instructors are NASP Certified and USA Archery Level 2 certified. This is an 4 week course which is held several times a year. 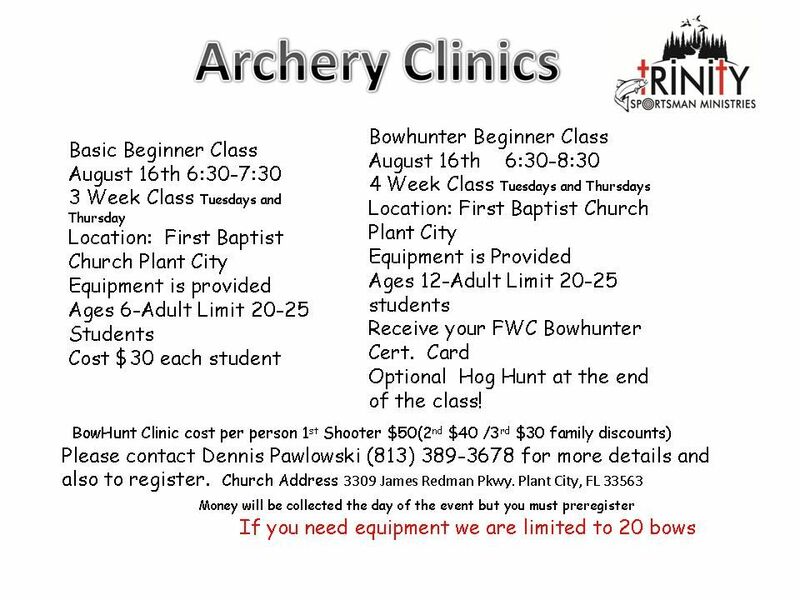 This course is an introduction into bow hunting. The class is for ages 12yrs to adults. Students learn the basics of compound archery shooting along with an introduction to bow hunting. Students hone their skills with a bow and are introduced to 3D archery targets. Once the class is completed a hog hunt is offered for each student . TSM is partnered with a few landowners and hog hunts are usually free of charge for all youth hunters but sometimes a small fee is required. Each class is a way to bring a community of archers and their families together in order to promote the sport of archery and Christian Values.